In 1994 the CAGC established certification standards for Canadian genetic counsellors including a Certification Board and a practice standard called the CAGC Scope of Practice to reflect basic knowledge expectations of genetic counsellors. This standard was revised and updated on a regular basis by the Certification Board. In 2010 the Certification Board began development of Knowledge Based Competencies, to replace the Scope of Practice, which was archived. The Knowledge Based Competencies reflect the continuing evolution of the profession of genetic counselling and the rapidly expanding field of medical genetics. In 2006, the CAGC committed to developing a Core Competency framework to address the need for uniform practice standards for the profession. 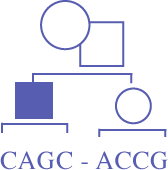 The CAGC Core Competencies include both the Practice Based Competencies and Knowledge Based Competencies and will serve as a platform for practice guidelines, training curricula, certification, continuing competency, re-entry to practice and other quality assurance initiatives for genetic counsellors in Canada. These competencies have been written assuming genetic counsellors will eventually be regulated professionals. In those jurisdictions where regulation occurs, these competencies may assist in the development of standards of practice for genetic counsellors.